A White House “examination” of Donald Trump’s daughter and senior adviser Ivanka Trump’s online habits has concluded she used a personal email address for official correspondence hundreds of times, in many cases in “violation of federal records rules,” the Washington Post reported on Monday. ... 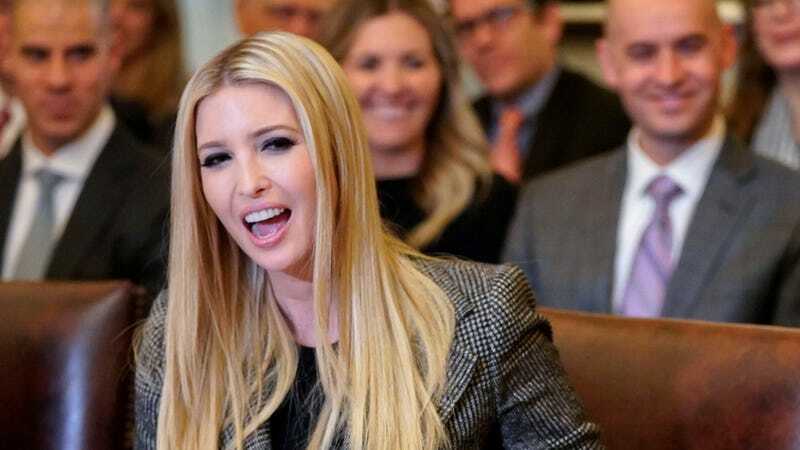 Some aides were startled by the volume of Ivanka Trump’s personal emails—and taken aback by her response when questioned about the practice. Trump said she was not familiar with some details of the rules, according to people with knowledge of her reaction. Politico had also noted that a number of White House staff including Kushner, ex-chief strategist Steve Bannon, ex-chief of staff Reince Priebus, ex-economic adviser Gary Cohn, and Ivanka Trump were using personal devices or email addresses for official business despite clear policies asking them not to. They all reportedly did it anyways. However, the Post report says that Trump’s use of personal email was much more widespread than previously acknowledged. A spokesman for Ivanka Trump’s attorney and general ethics counsel Abbe Lowell, Peter Mirijanian, told the Post that she had only used her personal account until she was given “the same guidance” provided to other officials. He added that she had used the personal account “almost always for logistics and scheduling concerning her family,” as well as that the emails had been turned over for records-keeping purposes and contained no classified information. Other sources told the paper that Trump discovered she had somehow been excluded from regular reminders about the prohibition on use of personal email, though it stretches the boundaries of credibility to believe she was never told, ever, not to do this. And he stressed that her email use was different than that of Clinton, who had a private email server in the basement of her Chappaqua, N.Y., home. At one point, an archive of thousands of Clinton’s emails was deleted by a computer specialist amid a congressional investigation. As is beyond obvious at this point, a reckless disregard for information security runs in the family. Ivanka Trump’s dad, the president, is reportedly still using both his Secret Service-provided phones as well as a personal one despite repeated attempts by federal counterintelligence personnel to make it clear to him that they are not secure and likely compromised by foreign intelligence agencies.